As a food manager or supervisor, you have a duty to abide by the provisions of Regulation (EC) 852/2004 of the European Parliament. This includes the Hygiene of Foodstuffs, the Food Safety Act 1990, and Food Hygiene (England) Regulations 2005 for the implementation of a food hygiene and HACCP procedure within a food environment. Only by providing effective HACCP training can you ensure that you and your employees are suitably competent to fulfil duties safely and to internationally recognised HACCP standards. 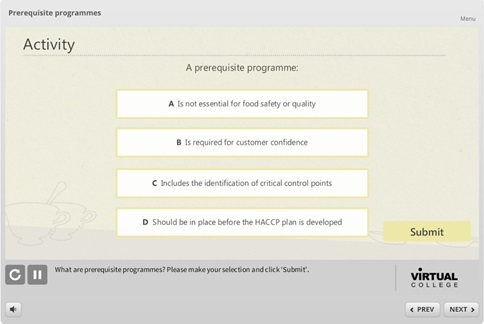 Our Level 3 HACCP online training course will guide managers and supervisors through HACCP guidelines to successfully implement and monitor food safety practises in the workplace. 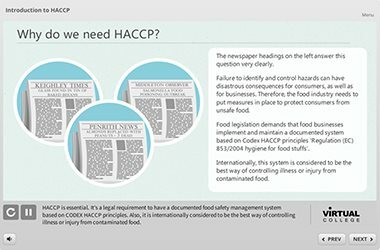 The HACCP system (Hazard Analysis and Critical Control Point) is a food hygiene and safety management procedure through the analysis and control of biological, chemical and physical hazards from production and manufacturing of raw materials to the handling, distribution and consumption of food. 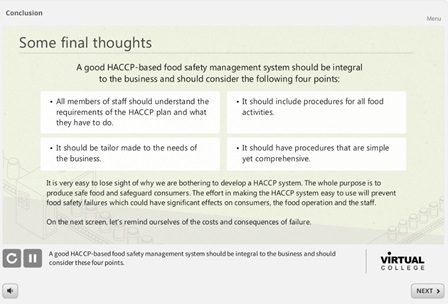 For food businesses, the HACCP analysis system is developed by owners and managers to ensure that food is safe for consumption and that hygiene and safety procedures within a food environment are applied and maintained. The responsibility for the implementation of the HACCP system however, lies with all of the employees. 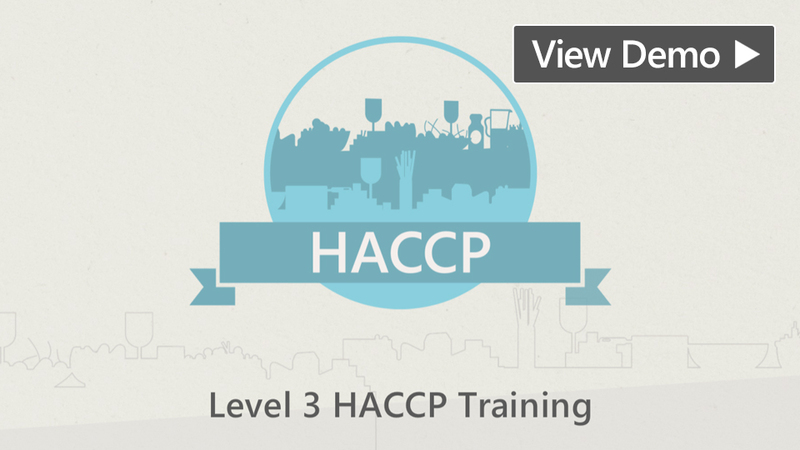 This HACCP course is designed for supervisors and managers who may be responsible for the enforcement and monitoring of food safety processes within a food environment. 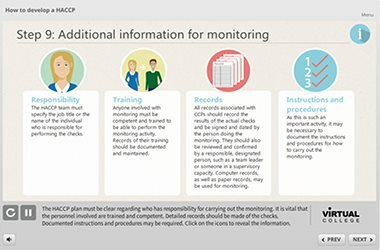 In order for a HACCP procedure to be successful, it is important that hazards are analysed effectively and that control points are determined and established for all employees to apply effectively. 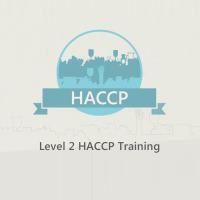 Upon completion of this course, not only will learners understand how to successfully manage and implement a safe and effective HACCP procedure, but will also understand and acknowledge your legal obligations through these food safety procedures and minimising damage to your business and reputation through lawsuits and reducing your risk of harm to employees and customers. Along with a CPD accredited HACCP certification, learners will learn to satisfy the UK legal requirement under EU food hygiene legislation (Regulation 852/2004, Article 5) for food businesses to implement a food management system based on the international HACCP principles and regulations. 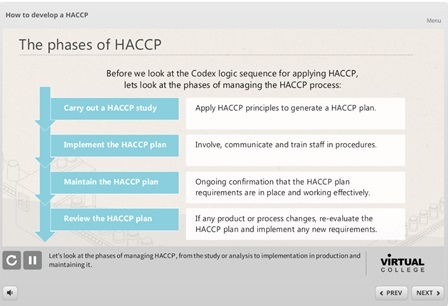 Approaches to HACCP - We discuss the approach to HACCP in this module, what the codex principles are and how these can be applied, we look at product specific HACCP procedures, catering models and retail models. 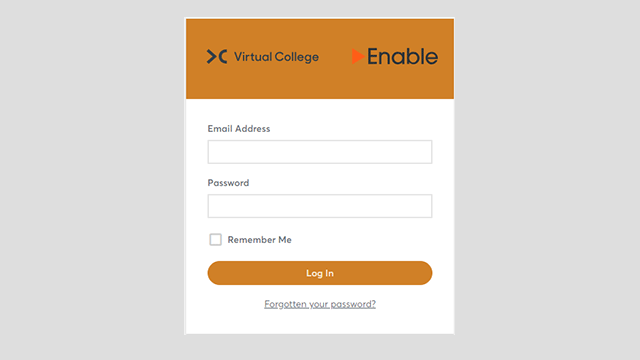 The content of this course has been independently certified as conforming to the universally accepted Continuous Professional Development (CPD) guidelines. 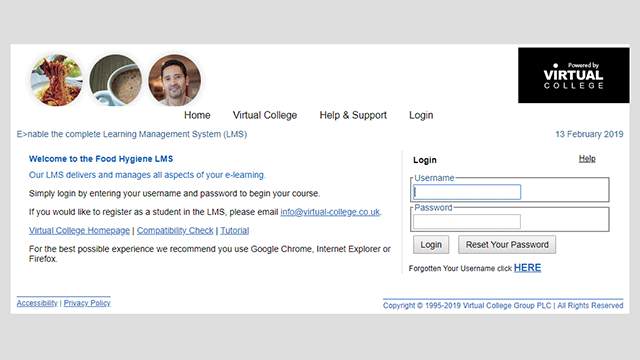 On average this module contributes 1-2 hours towards your CPD.